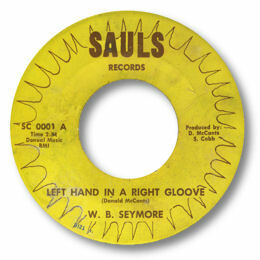 Another really obscure Georgia artist, W B Seymore’s gentle light tenor voice is just right for the delicate ballad Left Hand In A Right Gloove (sic), and his occasional foray into a falsetto range works well. The quavery trumpet leading the horn section may be an acquired taste but the rhythm is solid and I like the little guitar figure. Not a 45 you’ll see very often – mid 60s I’d guess. "WB Seymore was my brother-inlaw and he was not from Georgia. He was a Floridian!!" I'm grateful to Carlton for this correction.